Quality medium weight cotton twill tail coat. 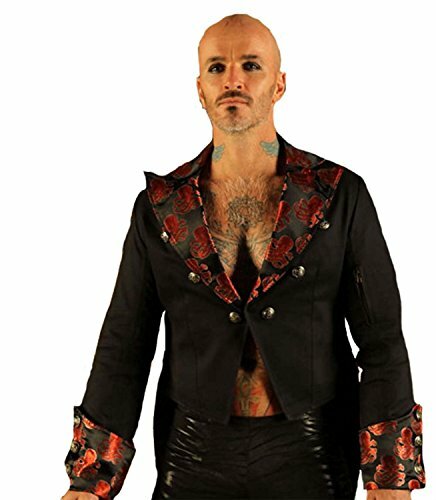 Mens black cotton twill tailcoat, cut short to the front, fastening at the waist with one hidden button, featuring antique brass Gothic theme buttons to the front and eyelets to the lapel. Long pointed split tail with two fully adjustable buckles and straps with metal D-rings to the back. Complete with further decorative buttons to the front and cuffs. A formal Victorian coat with tails. Beautiful brocade red skull fabric match. Fully lined with black satin. Six ornate metal buttons decorate the front and back. Six similar metal buttons are at each cuff. One special zip pocket on the arm (hidden). The measurements below are from the actual items..
Our sizing of this item runs small. Beautiful brocade red skull fabric match. Fully lined with black satin. Six ornate metal buttons decorate the front and Six similar metal buttons are at each cuff. If you have any questions about this product by Leatherotics, contact us by completing and submitting the form below. If you are looking for a specif part number, please include it with your message.